It’s no secret that marketing is a huge part of beer sales. Even the Craft Brewers have their angle (whoa there’s a farmer/tractor on the can? LOCAL!). But is beer the same as cell phones? Budweiser and Molson Coors seem to think so. If you’ve been to a Jays game in the last couple of years, you’ve probably experienced the bottom-fill beer cups. It pours faster and looks cool… but if you accidentally bump the bottom disk, when juggling a couple of hotdogs, your beer comes pouring back out. 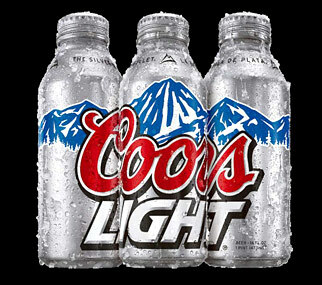 Well now Molson Coors is lining up for the summer with more aluminum bottles (you know, that stuff that cans are made out of), grip cans with “tactile ink” technology, and of course the cold ready technology. But the innovation that really takes the cake: the MGD punch top can. From what I can gather, it’s actually just a normal can that your are invited to puncture in order to improve airflow. GIMMICK?>!?! Well I don’t know who was asking for a smoother flow from their MGD can, but I guess taking a pointer from apple juice never hurts. Obviously this stuff isn’t needed. But, if it sells beer and creates a more enjoyable experience, then why not. And Molson will be the first to say they don’t need to change their beer, so why not focus on the packaging. However, I’ll take an IPA in a tall glass over a Coors Light Ice Tea in a can “that tells you its too cold to drink” any day. Lake view preferred as well.